It's March 13th and a Friday. | A.B.E. Remodeling, INC. Personally we are not the superstitious folks...but we chipper in with the date. Actually there are some interesting facts, thoughts and history about the """"13th"""". Here's just a bit of information I saw in quickly looking at a few articles. The infamous day has finally arrived. 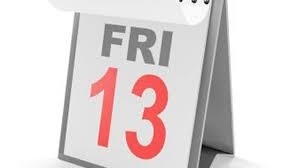 As many will attest, Friday the 13th is widely accepted in Western culture as being the unluckiest day on the calendar. Still, while everybody knows the day isn't the most promising one on which to buy a lottery ticket, few know why the day is considered so unlucky. According to National Geographic, the number 13 might have subconsciously been rubbing people the wrong way for years because of its association with the number 12. Numerologists consider 12 a so-called complete number due to things like the 12 months in a calendar year, the 12 signs of the zodiac, the 12 gods of Olympus, the 12 labors of Hercules, the 12 tribes of Israel and the 12 apostles of Jesus. Apparently, it is believed that 13 goes beyond being a complete number, therefore making it clunky and hard to deal with. Actually I like the number 13 but there are hotels that do not have a numbered 13th floor. Let us know your crazy thoughts about the Lucky or unlucky number 13. Whatever your take on it.... THIS IS FRIDAY and YEA, we all love our weekends-when many people have off. Sorry for those that have a job that requires working on weekends. HAVE A GREAT FRIDAY AND WONDERFUL WEEKEND. All our best. the staff at A.B.E. Remodeling, Inc.